The US Documentary Competition heads into the homestretch: Cynthia Hill’s PRIVATE VIOLENCE, an intimate and powerful exploration of domestic violence. The most common question asked of domestic violence victims is, “Why didn’t you leave?” PRIVATE VIOLENCE introduces us to two women whose stories illustrate the complexities and problems inherent in that question and encourages us to reevaluate the discourse about domestic violence. Kit Gruelle, a domestic violence survivor, has been an advocate for battered women for more than 25 years. We are privy to her educational sessions with police, consultations with experts in the medical and legal fields, and—most critically—her work with individuals, in particular Deanna. 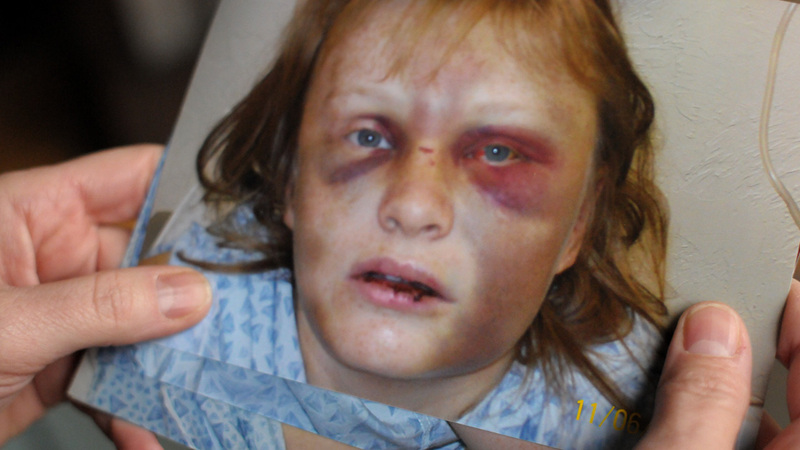 A young mother, Deanna miraculously survived kidnapping and brutal beatings by her ex-husband. When Deanna’s case goes to federal court, the stakes are raised as she and Kit battle to reunite her with her daughter, keep her abuser behind bars, and help her regain her dignity. Shot with skill and immediacy, PRIVATE VIOLENCE is rooted in the extraordinary courage of Kit and Deanna, who shed light on the cycles of abuse and the shortcomings of law enforcement and the justice system. In the process, they represent hope, empowerment, and the possibility of change. Director/producer Hill’s previous films have screened at Full Frame, RiverRun, and on Independent Lens. Associate Producer Malinda Maynor Lowery is a Sundance alum, having directed two doc shorts, SOUNDS OF FAITH (1998) and REAL INDIAN (1997). Among the projects executive producers are the iconic Gloria Steinem; Cindy Waitt, the executive director of the Waitt Institute for Violence Prevention and executive producer of the Oscar-nominated BULLY; Artemis Rising Foundation’s Regina Kulik Scully, who has the same role for fellow 2014 US Doc Competition title FED UP as well as for Sundance alums ANITA (2013), THE INVISIBLE WAR (2012), and MISS REPRESENTATION (2011); and the three principals of Chicken & Egg Pictures – Julie Parker Benello, Wendy Ettinger, and Judith Helfand, who combined count several Sundance credits, including fellow 2014 title LAND HO and alums AFTERNOON DELIGHT (2013), THE QUEEN OF VERSAILLES (2012, doc directing winner), PARIAH (2011), THE BARBER OF BIRMINGHAM (2011), THE RECRUITER (2008), EVERYTHING’S COOL (2007), BLUE VINYL (2002, doc cinematography winner), and A HEALTHY BABY GIRL (1997). Hill wisely focuses what can be an overwhelmingly large and extremely challenging subject through the lens of a distinctly strong and sympathetic main subject. Kit’s personal and professional experience with domestic violence carefully guides the viewer through the legal, psychological, and societal complexities of the issue, revealing her own story and that of several women she meets with as an advocate – most profoundly Deanna. The evidence of the horrific abuse the latter suffered may be difficult for viewers to face, but that’s part of the point – to confront us with the realities of their pain, turning the private public so that steps can be taken to confront and prevent further such crimes in the future. Ultimately both Kit and Deanna serve as hopeful stand-ins for countless others who may not have the voice to speak out – yet. Check out the doc’s trailer and Hill’s Meet the Artist Sundance video profile and Indiewire filmmaker interview. For more information, visit the film’s Facebook page and website. For screening dates and times at Sundance, click the link in the first paragraph. That sounds like a very powerful doc. Unfortunately with issues like domestic violence, it takes an intimate, personal and inevitably uncomfortable look at reality to stir people into action. Some of the most difficult to watch documentaries are the most rewarding.